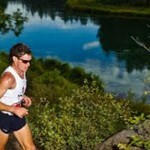 BEND, Ore. (Sept. 21, 2014) – It was a fast day at the USA 50K Trail Championships, held today at Bend’s Flagline 50K. A cloudless sky with temperatures in the 50s would bode well for the athletes to set off at a fast pace and as a result, both the men’s and women’s course records were broken. For the women, first-timer at the distance, Megan Roche, 24, Mountain View, Calif., led from the start and, in a competitive field, finished eight overall in a time of four hours, 40 seconds,, smashing the 2012 record of 4:11:28 set by Erica Baron. Next up for Roche, either the USA Half Marathon Trail Championships on Saturday, October 18, or the USA Marathon Trail Championships on Saturday, November 8. “It depends on my schedule,” said Roche who is attending Stanford to pursue her medical degree. In second for the women was Olympian Magdalena Boulet, 41, Oakland, Calif., who was also under the course record finishing in 4:10:49. Her performance was good enough for tenth overall and first in the masters’ division. “I feel pretty good,” said Boulet after finishing. 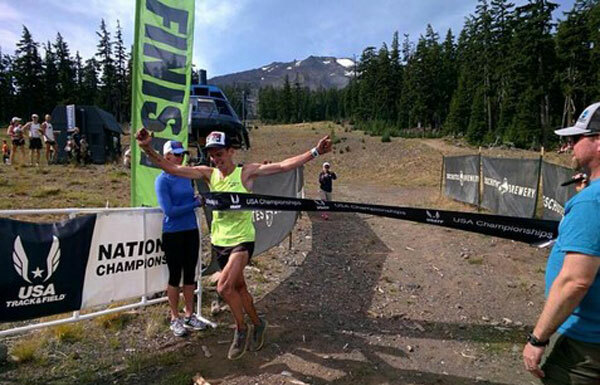 “Two weeks ago when I finished a 50K, I was pretty spent. Today, I felt pretty good. It’s a good sign for the longer distances I have coming up. “ Boulet will race a 72K in France next month, and a 50 miler in December. Rounding out the top three for the women was Amanda Brown, 24, West Linn, Ore., who finished in 4:33:56. The men’s race saw Tim Tollefson, 29, Mammoth Lakes, Calif. (pictured above, photo by Richard Bolt), in his debut trail race break away from the field some six miles into the race and finish with a course-record performance of 3:24:04. Hot on his heels was runner-up Ryan Bak, 29, of Bend, who chewed up a deficit which grew to more than three minutes to finish just 20 seconds after Tollefson. 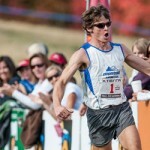 Bak’s time of 3:24:24 was also under the course record of 3:27:54 set by Max King in 2011. “Right from the beginning, David Roche took out the pace and I took it out right behind with Ryan,” said Tollefson. “I took some bad steps along the way to the first aid station and as we turned past the first aid station (at about mile 5), Ryan took off and I went right behind him. “He stopped on the climb to take some fuel and I put a surge on to see what would happen, and I passed him,” continued Tollefson. Bak didn’t answer the surge and Tollefson said he ran the last 25 miles or so by himself. About the course, Toillefson said, “I found those climbs to be very taxing on my legs. At around mile 24, I realized I didn’t calculate my fuel correctly and at mile 27, I tripped and slid head first toward a tree. That gave me a bolt of energy and I shook off the fall. “I turned around after we crossed the highway and I looked back to see Ryan like 30 seconds behind me. I didn’t have my GPS going, so I didn’t know how much distance I had left and as I was cresting the hill, I thought about walking. I didn’t, and after cresting the hill I just took off to the finish,” said Tollefson. “After we finished Ryan said he was hurting just as bad as I was. It was a bit refreshing. I know he has a lot of speed and I knew I might be in trouble. I was running scared at the end,” said Tollefson. David Laney, 26, Ashland, OR, finished in third timed in 3:31:20. He was followed by David Roche, 26, Mountain View, CA, in 3:34:08 and Sam Robinson, 29, Oakland, CA. Zach Ornelas, 23, Ann Arbor, MI, held on for sixth after having a few low points during the race. His time was 3:41:56. 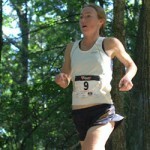 There were 148 starters in the 50K, 43 of whom competed in the USATF division. Awards were presented to the top ten men and top ten women overall, while the top finishers in masters age groups also received medals. Prize money was awarded to the top three men and women – $500/$300/$150 – and the top master male and female each earned $300.